The Dirt Dogs could deliver their biggest gold ever, while rookie crew The Scrappers must overcome a family feud before they even pull one nugget from the ground. The Dirt Dogs are back on fire and stake a massive million dollar target, while an eleventh-hour miracle saves the Gold Gypsies from disaster. The series follows crews of fearless opal miners on their mission to unearth a fortune in some of Australia's harshest and remote landscapes. 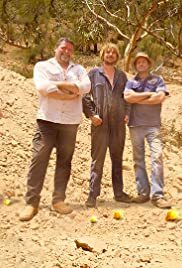 This tv show is the Aussie version of Gold Rush. I wouldn't mind seeing a few more episodes per season. Really good to see someone using machine which is well known in the Klondike. I hope this show continues for season 4.